Your new film Mutilation Man - in a few words, what is it about? 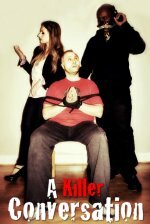 Our film is a thriller/horror film about a masked man who makes his way into a quiet neighborhood bringing nothing but torture and pain along with him. The police are on the hunt for someone with no identity, the only evidence of his existence is the mess he leaves behind. When he enters the home of Roy and Jessica, they have no idea what's in store for them. As the story unravels you find that there may be more motive behind the mans action's than either of them could ever imagine. The silent killer of Mutilation Man and his cool, almost laid-back demeanour contribute much to the utterly chilling effect of the film. How did that character evolve - and what does it all have to do with alarm clocks? We've always liked 'silent killer' aspect of this film. We wanted his body language to do the talking. As far as this character's wardrobe and body language goes, it was more of a tribute to the horror films we grew up watching in the 80's. In the film, Detective Rowe pieces together that the alarm clocks found at previous crime scenes indicated the time that passed while the villain's sister was dying. A total of four actors (you two included) are listed in Mutilation Man's credits to have played the film's villain. Why is that? The main villain character (face time) was played by Jaime Seibert. Due to scheduling, we had to pull in another actor, Paul Zurcher, to help play some profile & back of the head shots. He shaved his head for the part! All the other close up shots that didn't involve the characters face and head were played by the two of us due to scheduling. Derek and I would gather other b-roll shots late at night after everyone had left. If we had spare time, I'd toss on the outfit and we'd shoot the scenes of the villain picking up a tool, or the gloved hand gripping the axe, or the villain's boots walking, stuff like that. Your sources of inspiration when writing Mutilation Man? We wanted to shoot a film that reminded us of the older horror films we watched when growing up. So we got together on week nights and weekends after work and started writing our script taking that approach. How would you describe your directorial approach? And as co-directors, as you have been for many years now, how do you share responsibilities, and do you step on each others toes very often? As co-directors, we have always worked well together. We will go over the scenes together, usually acting them out with each other. Then we will write up a shot list & do storyboards together. We would always seem to be on the same page when discussing the scene(s). If one of us would suddenly come up with something different to shoot in the moment, we would chat about it quickly and work it in, without ever really stepping on each others toes. Though more built on psychological tension, Mutilation Man does get pretty violent at times. How did you go about those scenes, and was there ever a line you simply refused to cross? The film does get pretty violent at times, however, the scenes are pretty much exactly what we wanted. Even if we had a bigger budget, and could have pulled off bigger, more violent scenes using bigger FX, I don't think we would have. What can you tell us about your principal cast, and how did you get them to be in your film? Well Stephen Twardokus (Roy) and Jon Gale (Detective Rowe) have been good friends of ours for a while now. They have been in / helped out on some of our past film projects. We all work well together. Sabrina Carmichael (Jessica) and Jaime Seibert (The Villain) were both cast. We held casting sessions for weeks before we found them. They were great! To be honest, we just wanted to make another film. 2 years had passed since our last film, we were getting antsy! Since horror films are susceptible to sequels, and Mutilation Man is sort of open-ended: Will there ever be Mutilation Man II? We left it open for a possible sequel. Right now we each have several other projects in the works. Would we revisit our story for Mutilation Man in the future? Depending on the response we get from part one, we would consider a part 2 for sure. Let's go back to the beginning of your careers. What got you into filmmaking in the first place, and did you receive any formal education on the subject? Well Derek was actually looking into a different career at the time but our dad talked to him about going after a dream rather than settling for a job he didn't really want. He used to make short films in our home town and loved doing them, so he left home to pursue his dream of being a director. As for myself (Shane) I worked factory work growing up, and always found myself entertained after work by watching movies, especially the behind the scenes segments. I wanted to get into the film industry, work behind the camera. I worked and saved money. I packed up my car and drove out to LA one month after Derek moved out there. As for our education in the 'biz', we both landed jobs at several film/television studios working various productions. On our spare time from working these production jobs, we started writing/filming our own projects. Before going into indie-filmmaking, you have worked on quite a few positions on quite a number of films and TV-shows. Why don't you talk about those experiences for a bit, and why did you take the plunge into directing a film, and how does indie filmmaking compare to working on a studio-backed picture or show? Shane - I worked on an animated production as a production assistant upon first moving to Los Angeles. Although animation is not what I wanted to pursue, the studio at the time only had that position open. I took it. Met some great people during the production. One of whom, ended up at a different studio, a TV/film studio, after that production ended, she referred me, and was hired there. My first gig was however, another animated production! When that ended, I was able to latch on to some of the TV/film productions the studio was producing. I ended up shooting behind the scenes for some of the projects, and became production coordinator / office manager for each show that came down the pipeline. As for our own indie productions, they differ from studio backed projects in many ways. The biggest is budget. We need to get creative. When I worked for the studio, one day I'd be on set with an A-list cast, locations are blocked off by police, grip trucks line the street, hundreds of people are all busy with various jobs... Then I go home and set up for our film, and the crew member I have is also my co-director, my brother! One of the basic laws in no/low-budget filmmaking is - write what you can shoot. There is no studio backing your project here... You have a friend who owns a house? Great, write it in! You have a friend who works graveyard shift at a bread warehouse who has full access? Great, write that location in! Now for the creative part. How can you make this look like a bigger film? I love it. All in all, I have a blast on our indie film projects. We get as creative as we can, with what we have access to. Derek - I worked at a production company that did a number of TV shows and I was the Assistant to the Production Manager. It was a lot of fun and I got to learn a lot of how to shoot working there. I was even used as the cameraman or sound guy on several of the shows. That same production company owned a Sound Stage and they had me as their stage manager. I got to meet so many good people and got even more training by talking with them and helping on set up and tear down of the productions. I worked on Scare Tactics for its first season and that was probably the most fun I had on a set. I would watch the special effects guys on that show make up some crazy stuff to scare people. I worked on several big features and I had a great time but I know I don't have that at home so it's hard to compare. I would love to make a feature with money so I can get even better shots or scenes but the one thing that indie films have over studio is, you are in total control of what you are making. There are no producers jumping in telling you how they think it should go. I also know that you can make large budget looking shots but you really have to put some thought into how you and the one other guy (brother) can do to make it work with just the two of you. Like Shane said we write to what we know and what we can do, I feel that is playing it safe but when it comes to shooting we have always pushed our limits and make each scene bigger than what it was written without changing the story we are telling. If our efforts fail, go back to the fail safe way we first thought of. A few words about your first feature, Human Behavior? It was a learning experience. Instead of testing the water with a short film we decided to jump in head first and make a feature so we could get an idea of what it takes. It was hard but we set out to make a sellable feature for DVD and we did it. You have also worked on quite a few anthology films and shot quite a few shorts. Why don't you talk about those for a bit? Our project Visions of Horror, which is a compilation of short horror films, came about one night after a Fangoria's Weekend of Horror in Los Angeles. Shane met Tiffany Shepis, Denise Gossett and several other horror enthusiasts that weekend, who all ended up working on the project. We had this idea of making a compilation of short films and putting them on a DVD. We needed a host, so we pitched the idea to Tiffany Shepis. She was game. Denise Gossett runs Shriekfest Film Festival, with her connections, she recommended several short films that made it in the compilation. Visions of Horror ended up getting picked up by Virgil Films & Entertainment distribution company. Shane - My short film Everyday Joe starring Jason Charles Miller & Persia White is available on Amazon as a digital download to rent or own. 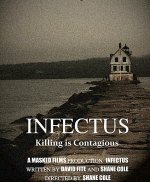 I'm currently in pre-production on two thriller/horror features titled Infectus & Garden of Faces, both of which I'm looking to produce/direct in Maine. I'm also currently writing a script for a low-budget feature thriller film with my partner Megan Lynn, which we plan to shoot right here in the Los Angeles area. Derek - My next feature is titled Revenant. Stephen Twardokus (Mutilation Man) is starring in it and he also wrote the screenplay for the film. This film has been one of the best experiences I have had on a film thus far. 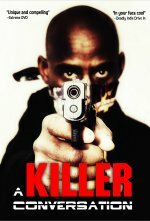 It will be out early 2012. Most of your films are of the horror variety. Is this a genre especially dear to you, and why? We love the horror genre because thats what we grew up watching. We both like other film genres... Comedy & Drama. But we live comedy and drama on a daily basis. Horror is something you don't get to do on a daily basis. It's fun making things up, escaping your reality for a while. Derek - Steven Spielberg and Peter Jackson mainly for Peter's early career cause he always pushed the limits. Shane - Peter Jackson, Sam Raimi, Don Coscarelli, Spielberg, David Cronenberg, Joe Dante, James Cameron, Stuart Gordon to name a few. Derek - John Carpenter's The Thing, Jaws, Pumpkin Head, Halloween, and Poltergeist. Shane - John Carpenter's The Thing, Terminator, Evil Dead, Pumpkin Head, Aliens, Friday The 13th films, Jaws, Halloween, Intruder, Shocker, Darkman, The Fly (1986). Derek - Don't really dislike any movie cause movies in general are art so how they decided to tell it, whether I agree with it or not, its a form of art and expression from that person. Everyone has their own taste and I am sure there will be people that will not enjoy Mutilation Man or any other film in that genre. I don't agree with how some films are shot or acted but who am I to say they did it wrong. Shane - I agree with my brother 100%. 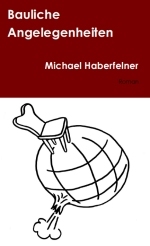 The release date for MUTILATION MAN is December 6th, please look for it and check it out. Distributed by Midnight Releasing - www.midnightreleasing.com.